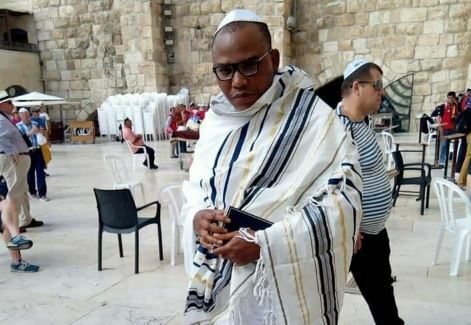 We had earlier reported that the controversial leader of the now proscribed Indigenous People of Biafra (IPOB), Nnamdi Kanu, was spotted in Jerusalem, Israel (Read HERE). Photos and videos of the man praying in Jerusalem went viral on the internet and caused quite a buzz afterwards. The IPOB leader went missing in September last year after the military invaded his home in Abia state. This is the first time he will be seen since then. Now, many Nigerians on social media have reacted to the news of his re-emergence.